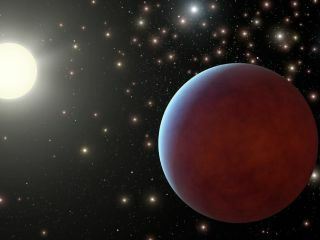 Artist's concept of one of the two gas giant planets discovered around different sun-like stars in the Beehive Cluster, a collection of about 1,000 tightly packed stars located about 550 light-years away from Earth. The 221st meeting of the American Astronomical Society (AAS) kicks off Sunday (Jan. 6) and will run through Jan. 10 at the Long Beach Convention and Entertainment Center. The meeting, one of two held annually by the AAS, has been billed as the "Super Bowl of astronomy." "Our winter meeting is generally about twice as big as our summer one and is the biggest astronomy meeting of the year," AAS press officer Rick Fienberg told SPACE.com. New discoveries on alien planets, black holes, distant galaxies, and the worlds of our solar system will be presented. Scientists will announce the newest findings of X-ray, gamma-ray and optical telescopes, and astronomers will hash out the latest news about the universe's confounding enigmas, such as dark energy and dark matter — two mysterious types of stuff that appear to make up the bulk of the cosmos. More than 2,700 professors, researchers, and students are already registered, and the total attendance will likely approach 3,000, Fienberg said. In addition to distinguished scientists, Nobel Laureates, and up-and-coming leaders in the field, the meeting attracts some of the top officials in NASA, the National Science Foundation, and other research organizations. Scientists will discuss, town hall-style, the outlook for federal astronomy spending and the NASA budget in the coming year. Researchers will update others in their fields about the progress being made toward launching the Hubble telescope's successor, the James Webb Space Telescope, as well as building highly-anticipated ground-based observatories such as the Large Synoptic Survey Telescope (LSST) and the Atacama Large Millimeter Array (ALMA) in Chile. The last AAS meeting was held in Anchorage, Alaska in June 2012, and the summer meeting will be held June 2 to 6 in Indianapolis, Ind. Many of the big-ticket discoveries being presented at the upcoming conference will be discussed in press conferences that will be streamed live online throughout the week. You can watch the live webcasts here on SPACE.com where we'll link to our full coverage of the 221st meeting of the American Astronomical Society. Twitter users can follow along with the hashtag #AAS221.